I know in many ways this can be considered a boring entry. But these little skewers were so delicious and the context so cool that I just had to put them in. 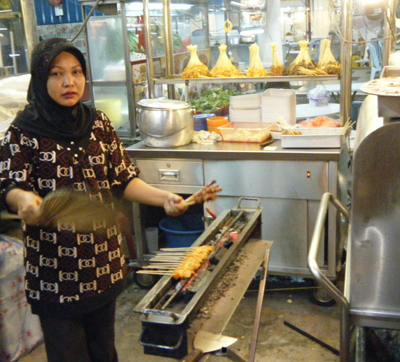 Jalan Alor is the main ‘streetfood street’ in Kuala Lumpur. And yes it’s fairly well known, yes many people who eat here are tourists. But there are a lot of local families too, the food is great and the hussle manageable. Plus the stalls serve great authentic dishes for around $3 which is not a bad price at all for the capital. 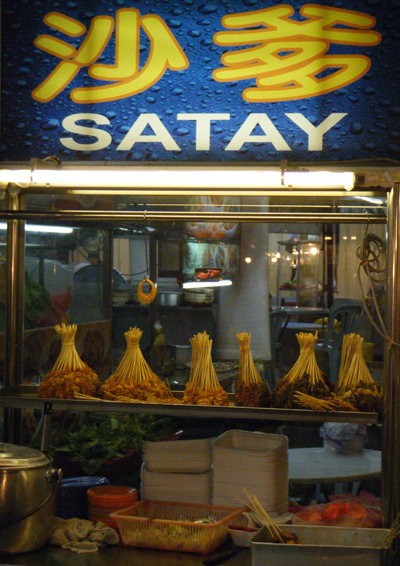 My favourite little dish, however, the nation’s signature, chicken satay. On food street they have a number of turning spits run by fan beaters who have a pretty horrible job, fanning meat by a hot fire. The result of their efforts, however, are delectably spit-roast little morsels of chicken served up in a fresh peanut sauce with a squeeze of lime. 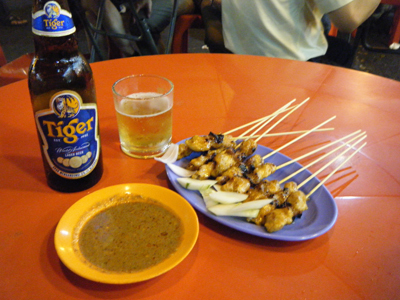 For about $2 a plate of satay, served with a cold beer, there are few better meals in Malaysia. 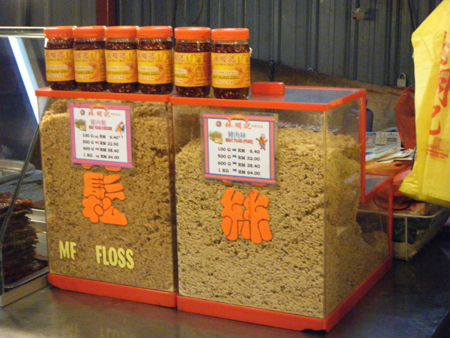 I’ve had this before in Hong Kong, and it’s not half as disgusting as it sounds. I’m not one hundred percent sure what they do to the meat, but I think it involves heating it to high temperatures, blitzing it to a fine consistency and then deep frying it. The result is meat (pork in this case) which honestly does have the consistency of candyfloss. It’s crunchy and melty in that kind of sugar-strand way, and with the meat and the oil it even has a bit of sweetness. It’s pictured here in a big plastic display cabinet ready for sale, but you can also get it from those rangy kind of grocer/medical shops you find in Hong Kong and other developed Asian countries. The best way to have it is as part of a rice ball where it adds a really good salty crunch to the soft rice, and to be honest I can’t think of another way you could serve it where it would actually be good. On its own it would be a bit greasy and strange.